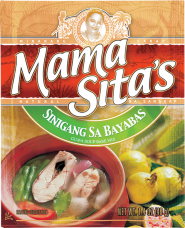 Succulent fish in a delicious soup made with Mama Sita’s Sinigang sa Bayabas Mix has a fruity and distinctive taste. Tip: Using kamote tops and rice water will usually result in more pleasant flavors and vibrant colors. Boil 3 cups water. Add onions, tomatoes, radish and Mama Sita’s Sinigang sa Bayabas Mix and stir to dissolve. Simmer. Add fish. Bring to a boil, cover and simmer for 10 minutes. Add long green beans and long green pepper, continue cooking until done. Add the kangkong or spinach. Cook for another 2 minutes. Remove from heat and serve with patis.